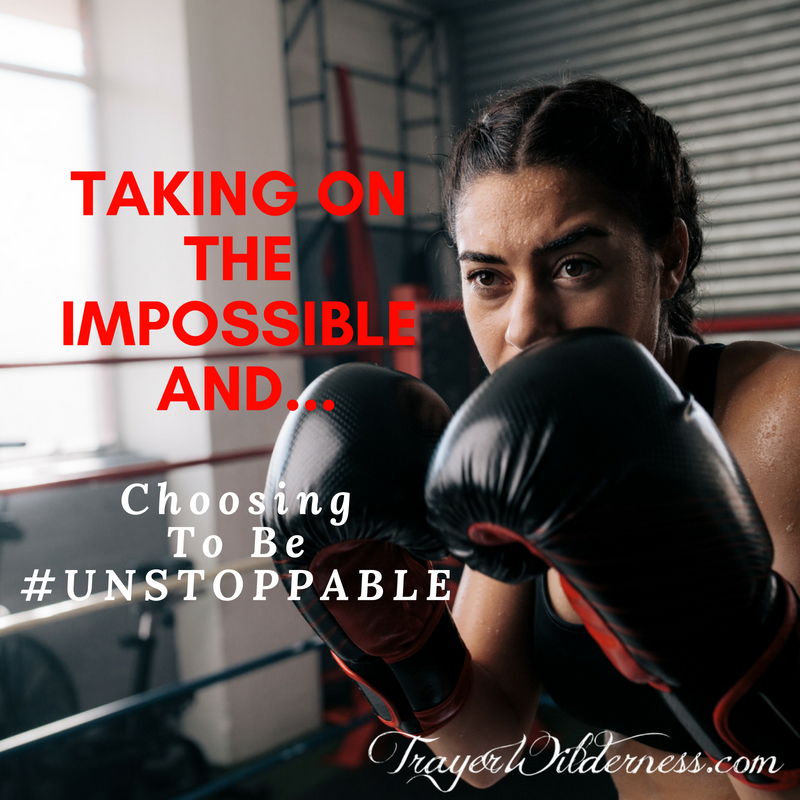 Sometimes in life, we need to “Take On The Impossible”, or at least that is how it feels, but remember in EVERY situation we have choices and we are CHOOSING to be #UNSTOPPABLE! We’ve decided this year we are going to be totally transparent in our situation in an effort to help others. We are on a slippery slope that is not kind nor pleasant, but we have been working extremely hard to move things in a positive direction with no prevail. In 2016, we traveled from Idaho to GA for my life-saving surgery, stayed in GA for 17 days, returned home to embark on a healing journey that I am still traveling today and went 6 1/2 months without an income during that time. Our medical bills were adding up and we were behind on EVERYTHING. In 2017, we had the illusion that we were catching up. Going into winter we had 4 nice construction jobs lined up for December that would carry us into the new year, but in November of 2017 those jobs fell apart due to the homeowner’s finances. SOOO we ended up going 4 months without work and an income despite our best effort while seeking, searching and being resourceful. Fast forward to today, June 13, we went too long without an income and catching up is no longer an option without a miracle. Over the weekend our family made a very radical decision to spend the next month and a half getting rid of all the unnecessary things on our homestead by selling things on an online yard sale and having a physical yard sale in July. The best time in my life was spent in the canvas wall tent while building this homestead. The simplicity is what I crave and that is what we are heading toward not that we don’t live simply, but we want to live simpler. Additionally, we are pushing to finish the cosmetic work in the interior of our home, organize the outside and prepare our home for sale by the end of August, all while still doing our normal day to day of working construction jobs, writing and maintaining our online businesses and keeping the homestead running. We can not make any concrete decisions on our future until this house sells so we are putting all our energy into making this happen and trusting that God will meet us halfway. I know that Trayer Wilderness, Trayer Wilderness Academy, and our family will remain in the wilderness of Idaho, we just don’t know where and how! When you take extreme leaps of faith we enable God to open the doors – our parachute may not open right away, but I fully trust that it will open and God will guide and be with us on this whole journey. He has been with us all this time – “So be strong and courageous! Do not be afraid and do not panic before them. For the Lord your God will personally go ahead of you. He will neither fail you nor abandon you.” Deuteronomy 31:6 NLT . 1. Sit, mope and watch the ship sink or file bankruptcy. 2. 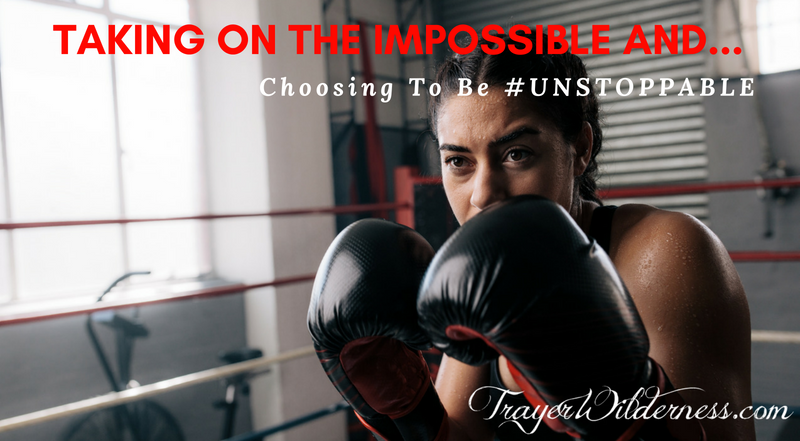 Take the leap of faith that we have and decide to put a positive and very aggressive plan in place. What is the worst that will happen? Well, we will fail, but we will fail knowing that we did EVERYTHING in our power to change our circumstance and make a difference not only in our lives but the lives of others through our steadfast trust and faith in God. He has a plan for us that is bigger and better than we could ever imagine or envision so regardless of the outcome I know we will be ok and well cared for and loved! One important aspect for us during this journey is to be sure we are listening to that still, small voice so that we are not steering this ship in the wrong direction and that we are following his plan and not ours! Something else I would like to point out is the importance of strong family bonds! We are one very STRONG family and we will conquer this new journey together. It is also important for you to truly realize what is most important in your life. Materials things will never hold value in our home compared to the relationships we have, our love for one another and our love for Christ. We are blessed beyond measure even in our circumstances and our LIFESTYLE has enabled us to be comfortable in a very uncomfortable place. We have not gone without food or shelter. We live a life of preparedness and are able to feed our family, give to those that are in need and still have some left over. This is all because we live daily preparing for tomorrow! You never know what will come your way and being prepared is SO extremely important! So join us on this journey as we step into yet another adventure in the lives of the Trayer Family! You can follow the step by step video journey (behind the scenes) here. If you are walking a similar journey right now, remember to keep your eyes fixed on Jesus versus allowing depression to set in or seeking a quick fix or an end all avenue! This is not the end of the world, it may actually be the start of something very exciting and new! God is good! If you would rather listen to the podcast – you can do so here on our website or on iTunes or Stitcher. Last time I covered many ways to save money when it came to food. Only I forgot to mention another way you can save! 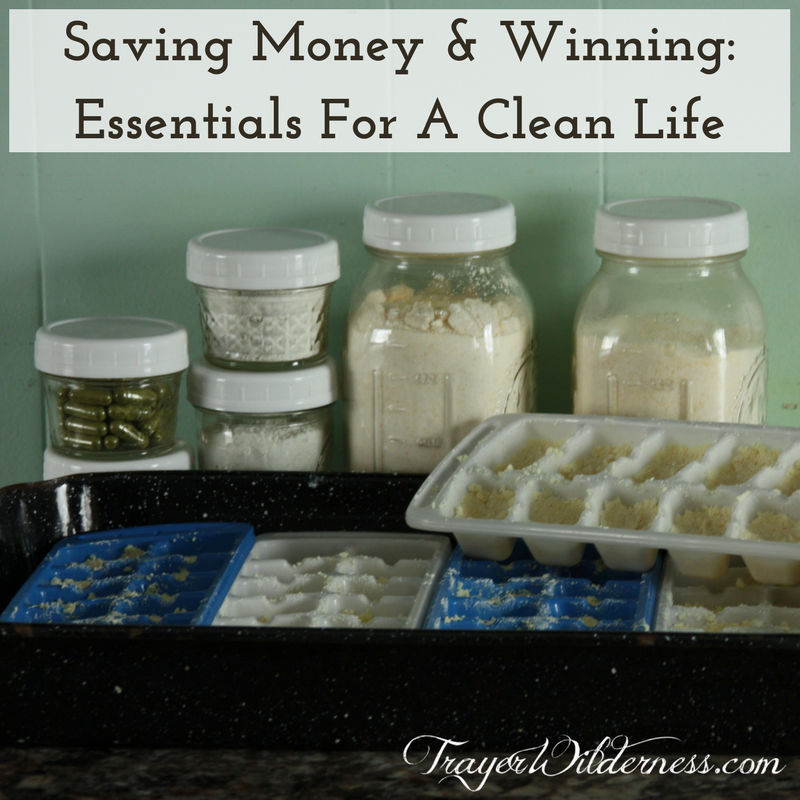 So, I’ll share that now and then get into other ways to save money on non-food related items. I lump this in with couponing because, again, I don’t have many instances where I can redeem what I’ve purchased but almost every week I can get 25 cents or more for what I do buy. And it only takes a couple minutes and adds up after time. I’m willing to spend that little bit of time to eventually get free money. There are several of these cash back apps. My favorite is Ibotta. I’ve earned the most on this app. Every so often they offer $0.25 just for submitting a receipt. Another is Checkout 51. In my experience, it’s harder to earn the minimum cash back. In fact, in the three years I’ve been using it I’ve yet to reach the minimum to redeem the cash back. Not so the case with Ibotta. There is one other that I’m aware of and have conveniently forgotten the name but I never was able to use it because what I buy is not processed foods and name brands. I’m hoping that you’ve figured out by the title what I’ll be covering today. Yes, all related to cleanliness. 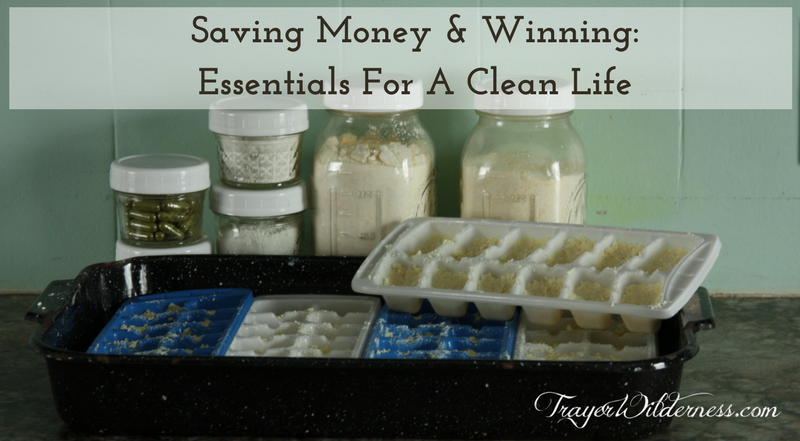 The first step I took to help reduce our costs was to begin to make my own cleaners after using up what I had on hand. I know some people say I should have tossed those chemically laden bottles of death but I couldn’t willingly throw them away knowing I spent my hard-earned money on them. And isn’t a homesteading creed to use it up, wear it out, make it do, or do without? The first cleaner I started with was an all-purpose cleaner. It’ so simple to make and the ingredients list is short: castile soap, super washing soda, borax (minimal amount so I’m not concerned with the controversy surrounding this), and essential oils like lemon and/or orange. Any citrus essential oil is a good choice for this type of cleaner. The next item I made was toilet bowl tablets. I quickly learned I didn’t like them and I don’t feel they were effectively cleaning my toilet bowl (and yes, I was scrubbing the bowl it just seemed that the “clean” didn’t last as long as it did when I was purchasing the brand name one I used to use). Sometimes it’s a matter of trying something and if that doesn’t work try something else. And that’s exactly what I did. I came up with my own “cleaner” which is essentially a squeeze bottle that I fill roughly 1/3 full with castile soap and 2/3 water. I then squeeze the mixture around the rim of the bowl and clean with the toilet scrub brush. Works like a charm and so much less expensive. And then I tried dishwasher tablets. And I’ll be honest, the recipe I found didn’t contain any “soap” at all and I just couldn’t wrap my head around that. So, I followed the recipe with the exception of the addition of castile soap. And I’ve been using it ever since without problem! My dishes come out clean! * cut into pea-size chunks (or grate) the Fels Naptha bar of soap, add to a blender. * Add about 2 ½ cups super washing soda to the blender. * Blend together to mix together. The blender isn’t necessary, I just find that it incorporates everything together really nicely. I use this in powder form. Because it doesn’t have the borax, which doesn’t dissolve easily, there is no powder residue on my clothes. I use 1–2 tablespoons per load depending on the size and amount of soiling. I haven’t had a problem with my clothes not getting clean nor have I had a problem with my clothes smelling….and we sweat a lot in the summer! It may not work for everyone but it works for us. At the very least give it a try. It doesn’t cost much. The Fels Naptha is $1 and the super washing soda box is $4. You only use 36% of the box at a time (cost per recipe for the super washing soda is $1.44). Total cost per jar is $2.44. For me, a family of three washing 5–7 loads a week this lasts roughly 2 months. Pretty economical if you ask me. What else? Oh, the glass cleaner. It’s as simple as 1 cup white vinegar and 1 cup water together in a spray bottle. Use two rags; one to wash with and one lint free rag to dry. You’re glass and mirrors will look great! And trust me, the vinegar smell doesn’t last long. Other areas items I’ve made at home are a foaming hand soap, dish soap, and liquid hand soap, and tooth cleaner. The foaming hand soap works great although it does require a slight shake to mix everything together before use. The dish soap I’m still perfecting as I’ve not been happy with the recipe that I found. The liquid hand soap is the most recent addition to my arsenal and so far, we have no complaints. The tooth cleaner though has gone thru several different iterations. The first couple years we used recipes that use coconut oil. However, we decided to not do that because we have concerns about the coconut oil clogging the pipes. So recently I’ve moved to a tooth powder. The last recipe used calcium and magnesium powder for remineralization but the flavor was a bit odd so I’ll continue to tweak it until I come up with something that works for us. For the record, my dentist has never seen any evidence that our dental health has declined since we started using homemade tooth paste/powder. The last area I want to cover is using fabric napkins and rags instead of paper napkins and paper towel. Now, I’m not saying to never use them but in our daily lives that is what we use. We’ll break out the paper napkins when we have company and paper towel when it’s a particularly yucky (think cat vomit) mess, something greasy, or to remove the poop from the freshly gathered chicken eggs. By reducing your use of paper products, you will save some money in the long run. Every little penny, nickel, and dime adds up. Next time I’ll cover the behaviors and habits that affect how effective we are with keeping money in our coffers. 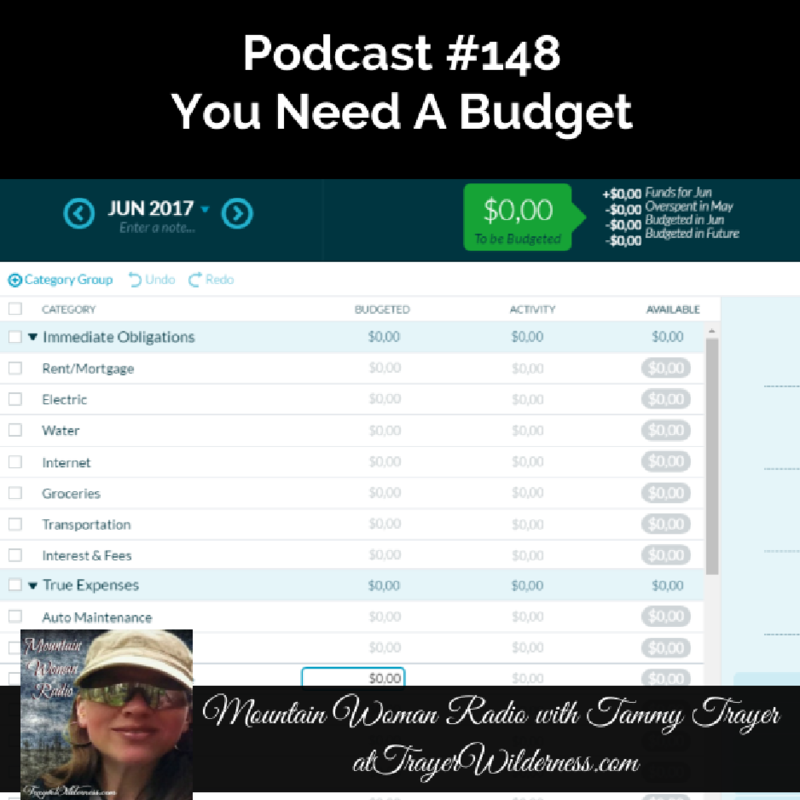 June 16th, 2017: In today’s show I discuss the importance of a working budget for your home or homestead. Without a real good working budget, you really have no solid footing and will always be guessing and getting further in the hole. If you like Mountain Woman Radio you can also Subscribe to me on iTunes or Stitcher. Submit a review on iTunes. You’re listening to the Mountain Woman radio show which can be found on our website at trayerwilderness.com and also on iTunes.You’re listening to the Mountain Woman radio show which can be found on our website at trayerwilderness.com and also on iTunes. Welcome to the Mountain Woman radio show where we’re homesteading traditionally 100% off grid today and offering preparedness and survival tips for tomorrow, here’s your host Tammy Trayer. Tammy: Hey everyone, welcome. So glad to have you joining me today and I wanted to thank all of you that have been reaching out and expressing how grateful you are that I am back. I’m so glad to be back and I’m thankful to have you listening and glad to hear that I am providing you with resources that are helpful to you and today I thought we would really talk about one that I feel should be like the center of everybody’s life and that is having a budget and–it’s kind of sad and today’s day and age everybody has credit cards and revolving credit and lines of credit and their houses are mortgaged and its just so much credit and it is so much debt. It is what’s being seen and it’s truly just hard to exist in that situation–it’s so overwhelming and it really takes its toll and people don’t even realize it and that’s the struggle that I see and the thing that happens is, you–nobody really knows what their extreme debt level really is because they just keep switching from one credit card to the next. And I have to say we were in that scenario for quite a while just because of circumstances but it’s not a good place to be and it’s not a place to be if you want to get ahead. You know we were building our homestead and things were breaking and we needed to get them repaired in order to move forward, our vehicles were breaking down, without our vehicles we couldn’t go anywhere, we couldn’t work. So you know you keep investing money and putting more debt on your shoulders and we were all guilty of it. But it’s a real refreshing feeling when you finally have a handle on your debt and you know where you stand, you know what your level of debt is regardless how overwhelming it is, you have that final number. And now the thing is to get yourself out of that position you put yourself in and learning–you know we live very frugally, so our needs are so much less than the average person. But you know unfortunately, our equipment often is more pricey. So you know when our backhoe goes down, we have much more pricey repairs than a lawn mower you know. So It’s just–the thing is you’ve got to be aware and you’ve got to pay attention to where your debt level is you’re spending and how frugal you are. You know a lot of people are out purchasing things not out of necessity, not out of need but out of want and it’s really easy to do when you go in the stores today. You know I see it when we walk into the stores, you know we aren’t shoppers but when we go to the big cities and we hit Walmart or something like that and you see all the big sales and all the new items and you know the new the new slow cooker and the new deep fryer, the new cooking pans that are really pretty and attractive but the thing is I already have all that stuff, so why buy the latest and greatest. You know in some cases it might help you but typically not and you’re just getting an additional piece in your kitchen that you’ve already got, so you’re adding clutter which clutter is a whole other ballgame and that in and of itself adds lot of stress and weight on your shoulders too because people don’t realize living in a cluttered space is so very overwhelming. So I want to break it out today and give you some resources that will help you to get yourself on track and maybe open your eyes to the fact that you are in a bad situation but you can very easily turn it around and start moving in a more positive direction if you start to be aware–and sometimes it’s hard to get your others-your other party, your spouse whether your husband or wife or even your partners you know involved and aware you know-oftentimes the weight of finances is on one person shoulder but in reality it’s really important that that weight is on everybody’s shoulders-that everybody is aware and that everybody is playing on the same playing field because if you’re both not on the same page you’ll never going to get out of the spot and you’re going to end up on a treadmill and just keep racing and basically chasing yourself. So it’s hard to get your spouse on board sometimes but it’s a necessity, they’ve got to be willing to understand and also accept the responsibility that they have helped to put you there. So that’s why I want to talk about this today because really you know God is in the forefront of our home and our lives and my husband is the next in line and myself and then my children. But in that mix of things, the budget needs to be in there and it needs to be something that is discussed and it’s important to have your children involved in some of your discussions, they need to be aware that it’s important to have a budget and that money just doesn’t come off of a piece of plastic because we’re not helping our children any. As a matter of fact I grew up where money wasn’t really talked about, not in a way of how to control it or how to handle it or how to spend it and I got my first car and I got my first credit card and it was great to have that mobility and it was great to have something to put my gas on but the same time it started me out on a really bad foot in my opinion and you know I never was taught to budget my money, I was never taught to handle my money and I was never really taught to deal with the checkbook. You know I guess I just assumed that was things I was learning in school. But that’s not the case, our children need to see that first and foremost and in a really realistic way. You know by seeing it firsthand how you deal with your money is something that can be a very good lesson for your children and so in your family the dynamics making a really big difference having God first in our life it is really balancing for us and he leads the way so it’s the way as far as we’re concerned that it should be. And in addition to that with our budgeting, the first thing that we consider always on top of anything else is tithing and I had shared-my husband and I shared a video on some of the miracles on our homestead and in all honesty those miracles started happening when we started being really visible once we started tithing above anything else and making that the first thing that we do with our money when it comes in. And it’s what we’re called to do and when you do that it’s been really amazing, I mean there have been times where the only money I had was a $100 and I needed that for a bill in two days but we were going to church and I tithed that money and I was trusting in God too and knowing that he would provide for that bill that I had do and you know we’ve never had to worry. When you put that much trust in God, it’s amazing the results. Now I know some of you may not be Christians or faithful people but stay with me because having a budget is really important this is how we do things and this is why I’m sharing it with you this is what works for us. Now–so that is one, that is the first thing we do with any money that we receive is that we tithe our money. Now additionally, it’s really important that you have a structure of some sort, whether you have a spreadsheet, whether you have a written note. Many people do it differently and I realize that there are certain things that just work better for other people and that doesn’t work for everyone else. It took me a good while to find the proper tools that I needed to be able to budget for my family because not only in my budgeting for my family but I am budgeting for four businesses as well. So it can be overwhelming and it can be really hard to keep track of and often times when we hit overwhelm we just don’t do anything and that’s not good; that’s often what happens-it’s like deer stuck in headlights. So you know you have to have the right tools, if something is not working for you don’t keep trying to use it, find something different. So today I’m going to give you some resources and tools that I feel are very beneficial to you. For starters, Dave Ramsey’s program is a phenomenal program his book; The Total Money Make Over, is worth every penny and you can find that by going to trayerwilderness.com/totalmoneymakeover and that will take you directly to his materials. That book is highly recommended and I think every family should read that book because it points things out for both spouses and really makes it clear that it’s not something that one person should be doing but that the family should be doing that as a team, as a partner-you’re partners you should be doing this together. So that’s a really important part of things but his concepts are very strong and very solid and I highly, highly, recommend them. Now he also does an envelope program and–excuse me. One of the things that you want to check out that will also be helpful tool for you and your preparedness efforts is the preparedness worksheet that we are offering right now. You can go to our website by going to trayerwilderness.com/newsletter and you can sign up for our weekly newsletter. It comes out every Sunday and you will find in there are the downloadable sheets and one of which is a budget. Now that is pretty much going off of Dave Ramsey’s budget and his program. So that is a tool that you can start out with Dave Ramsey’s book also provides principles that are available to you. So those are the places I highly recommend to start. Now as I said not everything works the same for everybody else, although Dave Ramsey’s materials are very solid, I had a really hard time using his budgeting materials because I have so much to keep track of so I did a couple things and I found the perfect set up for myself. One thing is I needed to carry the checkbook registers with me. I had to carry five checkbook registers with me in order to keep everything written in them was very, very, difficult. You know you only have so much space in your bags and I don’t like carrying a lot with me. I created a spreadsheet that is a checkbook register and in this spreadsheet I have different sheets in it for each of the businesses and our personal and I can keep track of my checkbook registers digitally or electronically which has been a lifesaving thing for me because on the fly I can enter any transactions, I know exactly what my balance is all the time because what was happening to me I was forgetting to write in receipts, so things are getting screwed up and I don’t like paying fees that was happening also because we do overdraft because I forget to write things in and I didn’t have the time to go back and balance the check books because I’m so busy. So it’s really a rough thing and I had to find a balance in that and I know there’s so many other people that are suffering from that. In that spreadsheet I also have the main sheet being an overview. So I know what my balances are when just by looking at the one sheet of all my accounts. And in addition to that, at the back of my accounts or of my worksheet spreadsheet, I have information on there that keeps track of yearly payments and different things in there and that’s how I was initially keeping track of that. You know you took the yearly things I need to keep track of for the businesses, for personal if I had automatic withdraws coming out of any of my accounts I had them noted and which accounts they were and then the amount, so I had that all in there but it was still cumbersome for me to keep track of things that way. So I found another program that has been an absolute lifesaver to me and it’s a very inexpensive program, Dave Ramsey talks about Fresh Books, I tried that it just didn’t work for me. I used Quick Books for our businesses for our accounting and our tax purposes but to really keep track of our budgets. I started using a program called YNAB and it stands for You Need A Budget. You can go to their program and get a 34 day trial period with them by using this link it’s trayerwilderness.com/YNAB – You need a budget. I highly recommend that you go there and try the program out and then to continue on with the program after the trial period it’s like 4.99 a month it is the best money I have ever spent for my family because I don’t know–I no longer have to keep track of my yearly and monthly expenditures in a spreadsheet, I can do that in each of my budgets. I can go into each of my budgets one for personal, my businesses and I can tell exactly what to do every month I can and I can budget out extra things and then I can see the reporting of how I did each month budgeting. You know did I go over? Where did I go over? How did we go over? You know it’s really important to be able to see what you’re spending and that’s the thing that most people don’t do. I guess you do have a credit card you just keep jamming stuff on there, you never really go back and evaluate things, you never see where you’re spending too much, you never see how frivolously your spending because you’re really not analyzing it. Well if you have a budget that is right in your face all the time and that is what you base your spending off, Dave Ramsey’s spends through envelopes. He puts–has you put so much money in an envelope for your food, for your electric, for whatever your expenditures are and when that money is gone that’s it and this you need a budget that works very similarly without the envelopes per se but I still use the envelopes. But it is in my face budgeting program that has saved us so greatly and has helped us greatly with our medical expenditures and on medical debt it has really helped us get a handle on things and really see things in the big picture. Like I said, it’s really hard but what you need to sit down and really figure out what your level of debt is. It’s overwhelming, it may make you cry, it may make you mad but you need to see it, and you need to be aware that you can’t keep pushing it off and you can’t keep living as if it doesn’t matter, it really does and I know that’s how most people are living today. And it will by budgeting and by having a handle on things, the weight on your shoulders will be removed so much and for those of you that are handling the accounting things and the finances by yourself, when you get both parties involved it makes such a huge difference and that weight also is something that is removed from you as well. Now as a closing thought for you folks, in addition to these resources that I have given you, there is one other resource that I think that should be listened to by every family and not just the parents but the children too. Joe McGee Ministries, Fighting For Families, is an amazing program and he talks about a lot like 90% about finances and financial struggles and financial fighting and how to get a handle on your finances. He also talks about raising children and balance in your lives and it is just a very wholesome 20, 30 minute program and we listen to it every week, I listen to it sometimes when I’m driving. I am very drawn and very addicted to listening to his program because it’s very solid, his advice is very solid, and his approach is a laugh and learn and it’s a lot of fun, it’s a lot of fun to listen to, it’s very humorous but you don’t forget what he has to share with you and I think that every family should listen to it. So you can follow him by going to trayerwilderness.com/JoeMcGee. But I highly recommend that you check him out check out, I got his materials, he’s got a lot of budgeting and financial materials available on his website and he often gives them away with his podcast for a small donation. So I highly recommend that you check him out and listen to him because it’s just-it’s just such a great tool not only for us adults but it teaches children how to manage their money and how to think about money. For starters, one of his biggest things is that we think poor and that is how most of us think. We’re in debt up to our eyeballs and we think poor. If you start thinking like a rich person and you start thinking in abundance, that’s what will happen. So I’m going to leave you with those thoughts today and I want you to really check out these resources because it has been a lifesaving thing for our family and something that we’ve been using for several years now and I am just thoroughly thrilled and thoroughly excited at where we are headed and how things have turned around for us like I said to you many times we went last year for six and a half months without an income. So to be able to move forward and turn that around is an awesome, awesome, thing. So I’m not just sharing this with you because I feel you need it, I’m sharing this with you because this is what I’ve lived and this is what I’ve experienced. So I wish you guys well, I hope these resources help you and I look forward to getting together with you again next Friday. You guys take care, feel free to reach out to me at survive@trayerwilderness.com, I’d love to know if you’re looking for certain topics, if you have questions, I’m always available. Thank you for your time and we will see you next Friday God bless. You’re listening to the Mountain Woman radio show where you will learn something new every week, we hope you enjoyed the show and encourage you to join us at trayerwilderness.com and be sure to connect with us on iTunes, remember your reviews on iTunes are very important to us and help us reach more people just like you.